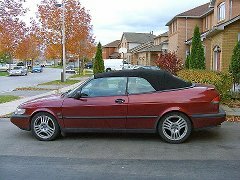 Our 1995 Saab 900SE turbo convertible project. The goal of the project was not to build a supercar, but to grow a car that's a easy to live with. It had to be reliable, fast, have predictable handling and good everyday drivability -- all those qualities that would let us enjoy it for a few summers to come. Some of the key steps were to improve the chassis by installing better suspension components, reinforcing the steering and tightening up the body. The engine has been rebuilt for larger displacement (the proven Saab 2.3L design) and tuned for higher output with a custom Nordic stage4 ECU. This in turn called for a newer and stronger gearbox and a clutch to match. The exterior remains largely untouched, except for later style transparent blinkers and removed chrome bumper strips. There are no plans for installing any body kits or otherwise enhancing the appearance of the car. It will remain stock from the outside. Period. Another point of the project was to use only off-shelf parts that are easy to find, install and replace. Having no custom built hardware could also serve as an example of what could be achieved within a short timeframe on a reasonable budget and be a guide and inspiration to others. We maintain a complete upgrade and service log explaining every bit of work performed on the car, as well as maintenance, expenses and other related items. 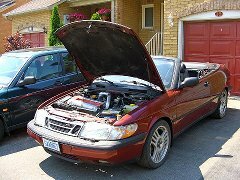 The summer's near, and here's a great way to celebrate it: a 1995 Saab 900SE turbo convertible. The car came from a local auction, with the body and interior in surprisingly good shape. Unfortunately, it was not that good mechanically. It needed work in many areas, including the engine, transmission, suspension and soft top. 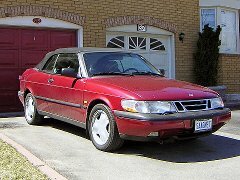 Therefore the goal of this project was to build a better Saab convertible. The work started with interior. 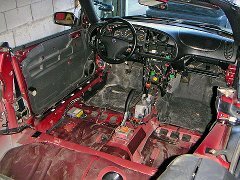 The seats and dashboard were removed, the side panels and carpeting stripped. The next step would be to clean everything up and prepare for soundproofing and audio upgrade. 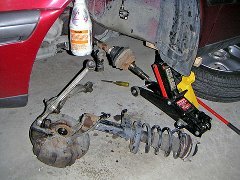 Suspension removal. The front end is up on stands, the wheels are off, and the front struts together with suspension arms and calipers are being removed from the car. Then I find that I need to fiddle with the soft top to get to the rear shock towers, and finally the whole rear axle meets the floor. Powertrain disassembly. 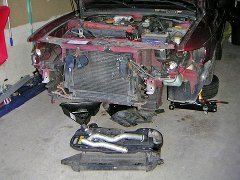 The headlights, grille and bumper come off to allow the access to the intercooler. The intercoler is then removed with all the pipes, and the airbox follows it. The exhaust system is easy to remove as it's held together with only rubber hangers and clam clamps. 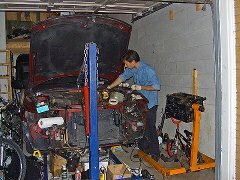 The gearbox gets unbolted from the engine and lowered to the floor. And finally, the engine comes out with a help of a friend and a 3-ton shop crane. 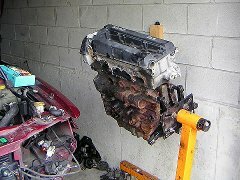 The engine is being replaced with a 2.3L block from a Saab 9000 Aero. The replacement engine came from a scrap yard, so it first gets stripped, disassembled and sent to an engine shop for machining and polishing. All accessories and manifolds are also refreshed and cleaned. 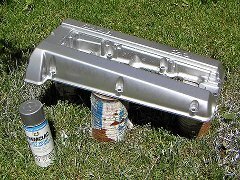 New finish for all kinds of parts: valve cover, engine block, suspension. All parts have finally arrived, and the assembly work begun. You can see there's a space issue. The garage is pretty tight, so keeping all the parts and tools around is a bit of a problem. The car is out of the garage for the first time. Engine and suspension installation finished, wheels and bumper on. The front seats are installed temporarily so the car can be driven. Here's a short video [YouTube] of the car rolling out of the garage. Soundproofing is the last step before the final interior assembly. 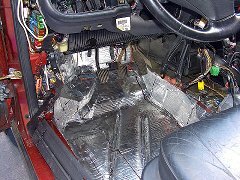 A layer of B-Quiet Ultimate sound deadening material is applied on the inside of the door and the outer surface, footwells, floor and side panels. 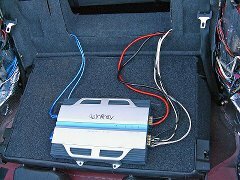 The stereo system is upgraded with a more powerful four-channel amplifier, all new wiring, Infinity Reference component speakers in front doors and on the dashboard, and larger speakers in the rear for increased bass output. A final shot of the car. It already covered about 5000 km since the rebuild. There were zero problems (aside from this suspension issue). The car established itself to be solid and reliable, easy to drive in everyday traffic, and fast and capable when you want to have fun. 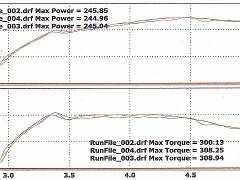 A torque and horsepower graph from a Dynojet dyno, taken at ambient 22°C (71°F), 29.4 in-HG. The shop only had a small portable fan, which limited the car's performance on the dyno. It only held 15-16 psi of boost instead of its usual 18-19 psi, and started to drop off at just 4300 RPM. As the result, the top figures measured were 246 whp and 309 ft-lbs at the wheels. Accounting for a 12% drivetrain loss, it gives 280 hp and 350 ft-lbs at the crank. The real world performance in more favorable conditions is estimated to be around 300-310 hp. A four-point roll bar built to CASC-OR specifications. I had to do this to make the car admissible to local driving events and high performance driving schools. 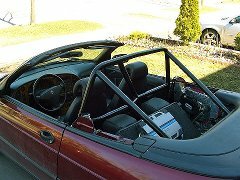 Fabricated by CSC Racing - one of the best roll cage builders in Ontario. It is removable, and fully clears the roof when installed. The bar bolts to the floor and the torsion box, and only requires the removal of rear interior panels to fit.